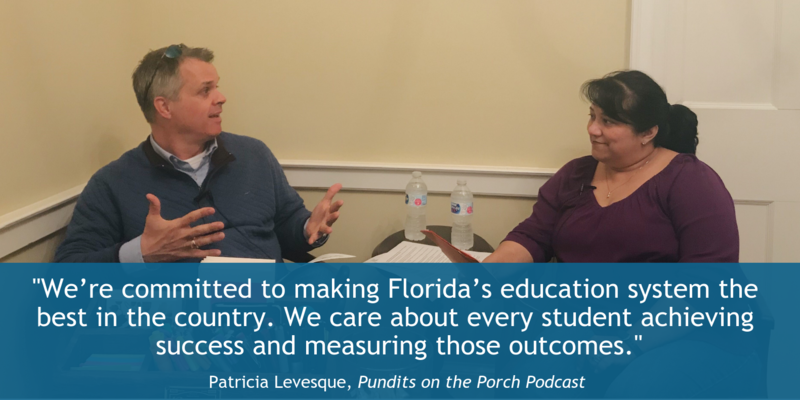 ExcelinEd CEO Patricia Levesque recently joined Voices4Ed and Pundits on the Porch to discuss one of her favorite subjects: education choice in Florida! Voices4Ed: Should Public Dollars Go Towards Private School Choice? In this episode of Education Post’s Voices4Ed podcast, ExcelinEd CEO Patricia Levesque talks about the expansion of the Florida voucher program that will enable more low-income students to gain access to state-backed scholarships for private schools. The discussion addresses concerns about the privatization of public education as well as the general state of education in Florida. On this episode of the James Madison Institute’s Pundits on the Porch podcast, Dr. Bob McClure and ExcelinEd CEO Patricia Levesque discuss the power school choice has had in Florida for the last few decades. The discussion highlights optimism for bolder policy reforms that empower Florida parents to choose the schools, courses, resources and programs that best meet their child’s unique needs, interests, aptitudes and learning styles.